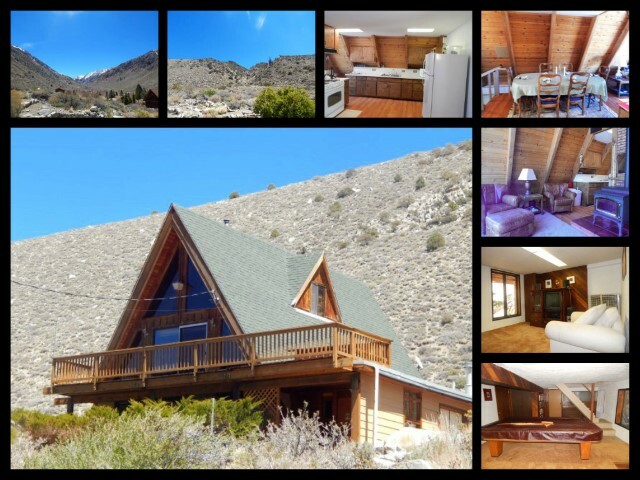 80 Canyon Drive, Bishop California- A Home with Views! 80 Canyon Drive is located in the Habaeggers area, just north of Bishop California. This beautiful neighborhood is located near both South Lake and Lake Sabrina and great for people who like open land and breathtaking views. This beautiful 2 story cabin is perfect for a full time residence or a vacation home. Offering 1 bedroom 2 bathrooms with 2 additional sleeping areas, a large open kitchen, living room with pellet stove, family room, enclosed patio and storage/workshop area. This home sits on 0.4 acres backing up to the Inyo National Forest with a long driveway adding privacy. Decks on both the front and rear of the home with breathtaking views all around, including Mt Tom to enjoy nature at it’s finest. A seasonal Misty Creek runs through the front of the property and Bishop Creek within walking distance. Habaeggers is a beautiful small community tucked back in the Sierra Nevada Mountains. About 10 miles out of Bishop, it’s a great place that gives you space and able to escape from the city hustle. Just South of Lake Sabrina and West from South Lake with streams and ponds in between this is a great place for the outdoorsman in you. There are a variety of trails that go deeper and higher in the mountains that will let you explore some of the more remote yet breathtaking trails, streams and lakes. If you want to stay home and away from the heat you can cool off with your toes in the stream in the shade of the quaking Aspen trees.